She’s in northern India. Keeping elephants warm. 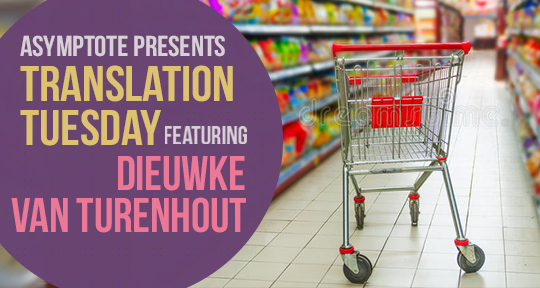 This week we are thrilled to celebrate women in translation by bringing you a heartbreaking story from Dutch writer Dieuwke van Turenhout. Beautifully translated by Michele Hutchison, this story makes use of the cycling tradition of the Netherlands to delve into one woman’s experience of loss. Now autumn has shown its face, I bike to the shops every day. I’ve stopped keeping my bike at the back of the bike shed; it’s at the front of the garage now. I avoid the asphalt road and when I cross the ring road it’s as though I’m seeing my old self through the windscreens of the waiting cars. I dress for the autumn chill and each time I put on my coat I think about you, and about elephants. (You can’t really call it chilly, objectively speaking. The weatherman, the one you despise, with the bent back and the stupidly hip suits, keeps smiling and calling it wonderful weather, but what does he know? I shiver and even wear your scarf indoors sometimes.). Tuesday was the first time there was a bit of rain, ‘real’ autumn. The oak trees and beeches along the canal shook their heads scornfully and punished me for going out by collecting big droplets and swishing them at the lenses of my glasses. I see completely different people now that I go to the supermarket at the same time almost every day. It’s strange to think that everyone was there already, and still is, and it’s me who is new to the choreography. The man at the bike garage is friendly enough. The first time I silently paid my fifty cents and, just as silently, he handed me a ticket made of thin Bible paper with number 034 on it. I suspected a whole world of misery behind his silence, a world of defiance. Maybe a wife who’d died too, but I was being just as uncommunicative and stowed away the piece of paper in my wallet—you know how bad I am at losing that kind of thing. The next time—it must have been a Wednesday, or maybe a Thursday back then—he recognized me and nodded. That day I was given number 072, so it was a Thursday. I was late because I had to roll the bins down to the road. I do that myself of course. I decided to leave them at the roadside, my bike has taken their place in the garage now. The cashiers are so young anyone of them could have been my daughter, except they wear lots of black eyeliner like the women in India, and they’re here, not there. The blonde one with the bun is saving up for a trip, I thought I heard her say. But maybe I only imagined it. About three weeks ago, an older lady with a tan appeared. I like to pay at her till, I feel more at ease with her than with those spirited teenagers. She’s very friendly but not too friendly. ‘Sausages and mash for tea?’ she asked the first time. I had to clear my throat just to say ‘yes’. Finally I added ‘you’re right’ and because the man at the bike garage and I weren’t yet on speaking terms, it was the only thing I said that day. There was much too much mash, even though I’ve been feeling hungrier with all that biking, and rearranging the garage, and then in the evenings I have to carry a tub of green waste and a bag of the rest of the rubbish down to the bins. What kinds of things does he eat? It’s not the cycling, nor the cooking itself, it’s imagining what to eat every day (and eating it all, though I’m beginning to get used to that). Then another cyclist came in, a lady with grey hair, with panniers on her bike, who chattered away good-humouredly, something about her husband, how busy it was in her part of town, her grandchildren, and the man from the bike garage listened just as good-humouredly and since I already had my bike and had already sat down on the saddle a couple of times, I had to cycle away. I’d have liked to have got some menu tips. The man from the bike garage smokes roll-ups and his hands are very rough, I noticed. (Who on earth still smokes? And roll-ups too!) Real workman’s hands, very different from mine; that’s the kind of thing that can really strike you. Does he see my hands and think ‘surgeon’ or ‘civil servant’ or ‘teacher’ or does he just think ‘on benefits’? He doesn’t ask questions, he says stuff like ‘PSV played well’ (or badly), ‘tyres need pumping’ and then we’ll talk about football or bikes and there’s always a bridge to another subject. ‘Like myself?’ I asked. Apparently there’s a whole group of people like me. I immediately pictured a kind of group holiday. Men who arrive in a bus covered in stickers and after a long journey through the aisles of the supermarket, chuck in the towel and buy a microwave meal. ‘People who cook for themselves and are looking for inspiration.’ I was still reflecting on that ‘inspiration’ when she shut the till. I still wear my wedding ring, even though it’s got too big for me. The recipes turned out to be for four people, just like the whole world seems set up for a family of four and single-bedrooms are only designed for children. Now I’m going to be eating stew with a kind of bock beer for the next three days. Speaking of beer and food: the neighbours’ house has finally been sold. I didn’t see a sign. Actually I was upstairs folding the washing, the kind of job that reminds me of you, and of elephants, even though it’s just my washing, even though everything reminds me of you, when the doorbell rang. A week or two before that, someone had come to the door unexpectedly and it was Jehova’s witnesses. I offered them a cup of coffee, just to see what would happen, and also for the company, but it was incredibly difficult to get rid of them again afterwards and their words weren’t of any comfort at all. I did realize I urgently needed to hoover the living room, so it served a purpose of sorts. This time it was the new neighbours. They’re incredibly young and I wonder how much the house must have dropped in price for them to be able to buy it. Or who knows, maybe he’s one of those internet entrepreneurs. Or she is, of course (I can hear you saying it). They’ve invited me around for a drink and a bite to eat, a fortnight on Saturday, the 31st. I looked at her mouth when she said ‘thirty-first’ and after that at the fields behind her, the autumn trees that shivered as they showed the boats the way. A year has passed. I hadn’t been planning to mark the moment, even though the pastoral assistant said it would be good for me. I don’t blame you for anything, the elephants need you, but what would I do on my own? No, I’m going to go round to the new neighbours. Drinks. Do you know I haven’t touched a drop in months? Actually, not since you left, or just before that. Strange idea that we used to drink a glass of wine every Saturday and Sunday afternoon and the evenings when we were all home. I looked in the garage, not that it was really a wine collection as such, but still, I spent some time looking at all the bottles. It looks like a real collection now there’s a thick layer of dust over it. The car had a similar layer of dust and I drove it outside, just to let the battery run. Washing the car wasn’t that difficult. I washed the car and gave the garage a good clean. My hands were red from the cold and the water. I didn’t dust off the bottles. Yesterday I lit the fire for the first time. I never knew that there was so much to dust in the house. The books. I didn’t throw away a single one, even though I’d always said it’d be the first thing I did. I haven’t read any of them since then either, by the way. The first rainy day, today. The fire burning in the fireplace again. The internet keeps me quiet. I’m wondering whether it’s difficult for you, living without Wi-Fi. ‘Do you want to come in?’ I said. She looked uncomfortable. I took pleasure in that. No one except the Jehovas has been inside for months, the people who still telephone always invite me to go out somewhere. To their house or a restaurant (‘then at least we’ll know you’ve eaten properly’). I do understand, it takes a bit of getting used to, for everyone. She repeated her excuses in the living room, saying again that no one could have known. It was hard to follow what she was saying, so many fast words bouncing about. Suddenly she was next to the mantelpiece, the picture of us. I thought about winter in India. About big maternal elephants, slow and clumsy, dying if they weren’t protected from the cold. I even showed her a picture of the things you knit and for a moment I smelled your newly-washed hair again at the airport, heard the zip of your rucksack closing, saw your mother’s knitting needles again, which you had to check-in. All that time it was raining outside. Michele Hutchison was born in the UK and has lived in Amsterdam since 2004. She was educated at UEA, Cambridge, and Lyon universities. She translates literary fiction and nonfiction, poetry, graphic novels, and children’s books. Recent translations include novels by Ilja Leonard Pfeijffer, Esther Gerritsen, Sander Kollaard and Tom Lanoye, plus the bestselling An American Princess by Annejet van der Zijl. She is also co-author of the successful parenting book The Happiest Kids in the World.